Have you ever seen an unusual colored horse? I know a breed that is not your everyday horse color. They are called Rocky Mountain Horses. I think they are beautiful — their color makes them unique. 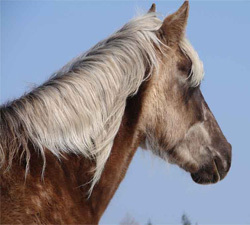 Rockies have a chocolate-colored coat and a flaxen mane and tail. Now that is a horse you don’t see everyday! Rockies come from Kentucky. The breed started around 1890. They were bred around the Appalachian Mountains and that is why they started being called Rocky Mountain Horses. They are called a gaited breed, which is the same thing as a Tennessee Walking Horse. Rockies are great in the show ring and fantastic in dressage shows. These horses have a great temperament, which makes them good, safe horses. They can be used with a beginner and also with more experienced riders. A Rocky Mountain Horse is overall a beautiful, gentle, elegant breed. I hope you look more into their history. Enjoy learning about the Rocky Mountain Horse! I know, Rockies are so pretty! that has another special gait besides the walk, trot, canter, and gallop. It is great to write again! PonyPrincess! I have missed hearing from you! You have such a unique style and it was a joy to hear you come back with such a fantastic blog! This breed certainly sounds interesting! i will have to look into it to learn more! You got me so interested PonyPrincess that I was sad when I came to the end! I look forward to hearing more from you! Hope you start writing regularly again! Thank you! You have a great style too, Horsecrazzz. I do have more stories and poems to submit. Hopefully, someday I can become a Junior Blogger.